With a weight of up to 3 1/2 tons, one of Africa's and the worlds most deadly and dangerous animals is the Hippopotamus (often called Hippo). This animal may look harmless but it is responsible for thousands of human deaths every year. What makes this water loving animal so dangerous is its huge size mixed with its aggressive nature and long sharp teeth. The kid-friendly information below not only list interesting facts but also points out why we need to take steps to protect this massive animal. Click here for a great selection of Amazon.com books about the Hippopotamus. This creatures name comes from the Greek language and means "river horse". Hippos means horse and potamus means river. There are two Hippopotamus species both who live in Africa. The large hippo of East Africa is a thriving species. 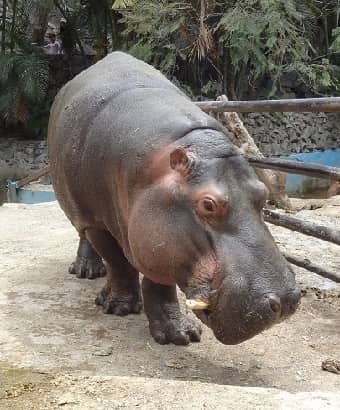 A smaller species Choeropsis liberiensis (pygmy hippopotamus) is much rarer than its large cousin and is found in West Africa. The large Hippo species is the third-largest land mammal on earth; only elephants and white rhinos are bigger. Hippos and their ancestors from which they evolved have been living in the wetlands of Africa for millions of years. In recent times humans have been encroaching on their land and killing them for their meat and teeth. In order to keep the balance of nature and the health of the wetlands in tact the hippo population must be protected. Conservation efforts are critical to keep this mammal off the list of endangered species. They prefer to spend most of their time where there is easy access to water such as rivers and swamps; however when it is feeding time they may travel several miles to find grass, a staple in their diet. A male hippo is called a bull, a female is called a cow and a baby hippo is called a calf. A bunch of hippos in a group are called a herd, dale, pod or bloat. A large opened mouth together with noises such as neighing, snorting and bellowing are sure signs that the hippo is ready for battle. Hippos are most comfortable in the water and spend much of their time wading in rivers, lakes, and swamps. Their heavy, dense bodies do not allow them to swim. Instead they stay in shallow water where they are able to walk on the bottom. Predators include crocodiles and lions; however it is humans, who hunt them for their meat and teeth that pose the main threat to their survival. Hippos rely on the mud and water to help keep their temperature down and keep them cool in the hot African sun. The animal's short legs and large build make it appear slow; this is deceiving; it can easily out run a human. Because of a natural reflex that forces them to come up for air, hippos can actually sleep under water. These creatures can weigh over three tons. The Hippopotamus has a plump, hairless body with short legs with each foot having four webbed toes. These animals have extremely thick skin. Hippopotamus secrete a liquid that looks similar to blood. This secretion acts as a sunscreen and an antibiotic to prevent against skin infections. Because of the way their eyes, nose, and ears are positioned on their head, they are able to submerge most of their body underwater and still be able to see, hear and breathe. While adult hippos are able to remain underwater for up to six minutes, young hippos can only stay under for about thirty seconds at a time. Newborn hippos are usually born in shallow water but are sometimes born on land. They usually weigh between 50 and 110 pounds (25 to 45 kilograms). A calf nurses for about a year before becoming independent.